November 2011 | Free Pc to Phone Calls, Free Voip Calls to India International ! I remember when we used to spend so heavily on our mobile voice calls usage. International calls were charged at very high rates, national and local calls were a bit cheap. Though calling rates have come down a bit (charged by your telecom provider), however if you switch to voip then you can save a lot on your phone bills. With smartphones in the market, mobile voip is also getting very popular. People have started using voip in their mobiles, that is making calls from your mobile itself however using internet. Today we will discuss about Qt Talk pure minutes calling card application. We will also discuss about the trial credit which Qt Talk is offering to all new users. With the help of the Pure Minutes application, users can make international phone calls at much cheaper prices, right through their smartphones without having to connect through a PC. It provides the users with a relaxed and natural experience while talking to their near and dear ones. QtTalk is available in both Apple and Android market. Yes you can use Pure Minutes application on your android mobile or your iPhone. As like many other voip services for these mobiles, Pure Minutes is offering free credit worth three dollars without any charge, which can further be used to make international calls. 1. Visit Android Market/Apple Store. 2. Search for "Qt Talk Pure Minutes" app in it. 3. Download/Install this app and register with QtTalk. 4. Voilla, you will get free credit worth $3 to make free international calls. QtTalk application also allows users to get call records, so it will be easy to keep a track of your calls. Another great thing about this offer is referring credit. QtTalk Pure Minutes application subscribers will also get three free dollars to their balance by referring as many friends as possible. Lets now check QtTalk which will give idea about "How much time will free credit last". Firstly the QtTalk Pure Minutes smartphone application for android and iphone is free for download. Calls to Dubai at : 27 cents per min. Calls to USA at : 5.9 cents (I am amazed at this high price, have I missed anything ?). If you face any difficulty in registering and getting free credit then please let us know. We will try our best to help you out! Localphone is back with its thanksgiving promotional offer. Almost every year, localphone brings a promotion to make free calls to USA at the time of Thanksgiving. If you are to make calls to USA then you need not to worry about the calling charges. Living in India, UK or any other part of the world, just use voip to call usa for free. With this Localphone promotional offer, you can call USA from India, Call USA from UK, Call USA from Germany or Call USA from any other part of the world : absolutely free. I have been using Localphone for quite a long time now and have no complaints about anything. Call quality is good, call gets connected within seconds and yes no expiry of credit. Offer ends in few hours : Hurry !!! Localphone is going to be offering free calls to the US for Thanksgiving. This offer is open to all Localphone customers. They can talk for as long as they want and to as many people in the US as they want and Localphone won't charge them a penny during the promotion. All calls to standard US landlines and mobiles will be free between 5am GMT Thursday 24th November - 5am GMT Monday 28th November and they'll revert back to the usual cheap rate of 0.5¢ per minute after the promotion. Localphone also offers first call for free. You can also use Localphone to make calls to other countries specially India. Currently, Localphone is running another promotion where it is offering free 100 minutes to India. So join Localphone with this promotional offer (enter coupon code FPBONUS : On purchase of $1 credit, you will get additional $1.5 credit : total of $2.5 credit) and make use of both Free Calls to USA for four days and Free 100 Minutes to India. SMSes have surely ruled the telecom industry and its market share is quite high. Some people prefer texting over phone calls and sms apps on smartphones are quite popular. 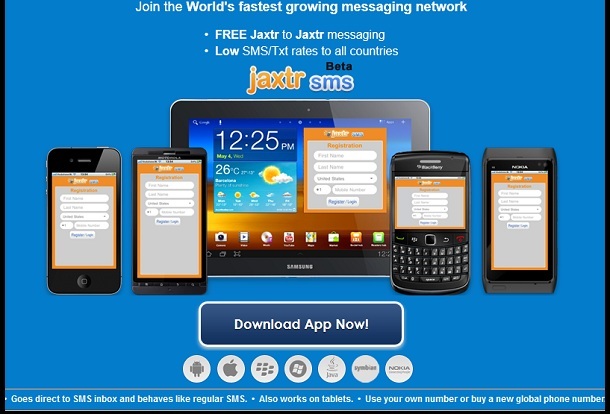 One of the most popular sms app for mobiles is JaxtrSMS. I am sure most of you are familiar with this app. It's been called the next big thing by many. Sending free sms from Pc has been quite popular, however JaxtrSms is different. It offers free mobile texting, its an advertisement supported multi-platform mobile application. If you have data connectivity on your phone (mobile), then you can use internet to send sms for free. Yes, you can send the sms to normal mobile as well (to the ones who are not using JaxtrSms on their Mobile). Jaxtrsms has launched its application for iPhone, Blackberry, Android, Windows, Java - and once you download this application you can send free text messages to any other mobile phone in the world. We have already discussed about the JaxtrSms Android and iPhone apps, and it is quite easy to use on mobile. Today we will be discussing about how to use JaxtrSms for iPad, Galaxy Tab, PC and for other android tab's. I have myself tried JaxtrSms on my iPad and it works great. I was able to send SMS from my iPad to Mobile phone in India and it reached within seconds. Considering that JaxtrSMS service is free, I would give full marks to them. So lets see how to use JaxtrSms on iPad. In similar ways it works for JaxtrSms for Android Tablets (Galaxy Tab) or your PC (You should download an android emulator on your PC first to use JaxtrSMS). - Download the JaxtrSMS app on your tablet. For iPad users, JaxtrSMS currently does not have any specialized iPad app, so better download the JaxtrSMS iPhone app from Apple Store. For Android tablet users, it has a JaxtrSMS android app. For using JaxtrSMS on Pc, use an android emulator on PC and download the android app. - After the installation, open JaxtrSMS app on iPad. Similar ways for Android and Pc users. It will ask you to enter your name, your country and your mobile number. - As you are on iPad/Tablet and not on any mobile, enter your mobile number here. This is mainly for verification purpose. - A message will be sent to your phone with a link. If your mobile has internet connectivity, then click this link to verify. - If you are not using internet on your mobile, then open JaxtrSMS app on iPad, try sending message to any number. It will ask for verification, this time select Verify by Call. JaxtrSMS will make a call on your mobile to verify it. Voilla, your mobile will now be verified. - Now try sending SMS to any number (use international code - like 919891xxxxxx for India). Send SMS for free. It should reach its destination within seconds. Please note that you can send SMS to any mobile number. The ones which are not registered with JaxtrSMS will receive a normal SMS (just like other telecom provider). As the service is ad supported, message will contain some advertisement. I don't think, people should mind about the ad as long as they are getting JaxtrSMS service for free. If you still face any problems on using JaxtrSMS on any of these devices, then please let us know. We will try our best to help you out. Video Chat and Video Calling feature has been on facebook for quite a good time now. Still I lot of people have not discovered about it and keep wondering about making video calls on facebook. Well, yes it is now possible to do Video chat on Facebook. You can make video calls to your facebook buddies directly from your facebook account. We will discuss how to do so. Please note that this is not restricted to just making video calls, if you don't have a webcam then you will be able to make voice call. If you and your friend both have webcams and microphones set up, you will be able to see and hear each other in real time. If you call friends who don’t have webcams, they’ll be able to see and hear you but you’ll only be able to hear them. Video calling feature of facebook is now default, however just to ensure that the video calling feature is enabled in your account, check this link. The video calling on facebook requires a one time setup. Facebook will ask to do when you try your first call or your friends call you. Click the at the top of their profile (timeline) and then click Call. Click the Set Up button and follow the instructions for how to set up video calling on your browser. Once you’ve successfully completed the setup, the call you’ve started with your friend should connect automatically. If it doesn’t, you can call again. During the setup, you will be asked to download a file (I have tried on my windows PC). 1. Download the file and run that file. (its an exe). Once the setup (Installation of a plugin) is complete, the call will start. Now that the setup is complete on your browser, you will be able to make video/voice calls on facebook. 1. Be online, that is open chat. You will see your online friends. 2. On this window, you will see a video call icon, as shows in the image on left. If your friend has video setup, he will get the call straight away. Otherwise, your friend will be asked to setup his account. If your friend is unavailable, you can leave a video message. The time and date of your missed call will be listed in your ongoing message history with your friend. Please note that the each call record will be saved in the facebook messages. However, the calls themselves are not recorded or saved. I am still trying to figure out how you can make facebook video calls on iPad/iPhone. I guess the facebook ipad app does not support this, neither does opening safari on ipad works (the call option does not appear). But don't worry there are some other ipad/iphone apps which enable you to make viceo chat/video calls/voice calls on facebook. We will soon discuss about these apps in separate posts. Stay tuned!! This post is all about the Localphone voucher codes and discount coupons which new users/old users can avail for bonus credit or get some discounts. We will be updating this page regularly with the latest information on the latest coupons and new vouchers. Localphone is one of the best voip providers for making international calls (call rates are also very cheap, calls to India at just 1-1.5 cent per min). I am myself using Localphone for all my international calls. One of the things which separates Localphone from other calling card is no expiry of the calling credit. Yes, the credit once purchased never expires. What I can suggest is buy credit at the time of promotions and use this at your own pace. There are plenty of reasons you should be using Localphone and making calls is so damn easy. FYI, we have a similar page for Rebtel as well (which is the second largest voip provider). Just watch the video below on how to make calls using Localphone. But before you jump on joining Localphone, use the voucher code (check below) and make use of the discount offers. It releases a new voucher, coupon codes each month. Keep checking this page for the latest voucher codes (discount coupons). Use this LocalPhone Link to Register and enter the relevant coupon code (check below) on sign up. Another month and we have another discount coupon for you (10% off on your first purchase). Lets check the details below. Localphone is offering a new november voucher code offering free 100 minutes to India. This is actually $1.5 worth calling credit (use it to call any country). This offer is one of the best offers by localphone! You get $1.5 credit on your first purchase. That is, if you buy just $1 credit you will get $2.5 credit. - That's like 150% extra bonus credit. - Your effective calling rate to India (if you buy $1 card and get $2.5 credit) : will be $0.006/min (0.6 cent per min). LocalPhone is offering a new promotion offering Free 100 Minutes to call India. Though voucher mentions Free 100 Minutes to India, however you will get Free $1.5 credit which you can use to call any country in the world. You get $1.5 credit on your first purchase. That is, if you buy just $1 credit you will get $2.5 credit. That's like 150% extra bonus credit. The localphone 150% bonus offer is still going on and localphone has launched another coupon code (september voucher code). The localphone September voucher code offers free $1 credit however as it is already running 150% bonus, its better to sign up using that code. Anyways lets get to this voucher code details. Code LP1NEW - Get £1 free credit when you top up £1 on your 1st order. - You will get free $1 credit on your first purchase. If you purchase $5 credit you will get free $1 credit, if you purchase $1 credit, you still get free $1 credit (this way your effective calling rates get half). - If you sign up with $1 then you will get additional $1. - Please note, that with Localphone you have no expiry of credit. Localphone July promotion is valid now. As your are following FPPC Blog, you will be informed about every latest offer. If you have missed out on Free 100 Minutes promotion, you can now try latest Localphone voucher code. With localhone, you get good voice quality, no expiry of credit and great customer support. - Sign up with as low as $1. - First call of 5 minutes absolutely free. Localphone has a voucher code ready for you. LocalPhone June 2011 coupon code is launched and we are here with the details. Localphone has a better offer this summer. - This will begin on 00:00 GMT on 1st June 2011 and expire at 23:59 GMT on 30th June 2011. - Apart from first call free, you will get 20% additional credit on your first order in March. This is actually an extra credit coupon. When you enter the following voucher code during checkout for their first order, and you will get 20% of extra credit for free to spend on calls, SMS, or Incoming Numbers. We all have so many different friends and we have accounts on so many different social networking sites and voice apps like Skype. It is really difficult to manage and all your friends on different applications (like Facebook and Skype). What's nice is integration of all the main features of these social networking websites into a single platform. Facebook is sort of trying to do so. With video calling on Facebook and Skype integration with Facebook, it is possible to call Facebook friends from Skype. Today we will be discussing about Skype and Facebook integration and see how you can call Facebook buddies from Skype itself. That is, you may be logged on to your Skype account and from there itself you can call your facebook friends. It is basically the new Mac and PC editions of Skype, which allow you to view your Facebook news feed (friends' status updates, links, photos and the like) from a 'home page', as well as contact Facebook friends in one of three ways: instant message, voice call and full fat video call. To begin setting up Facebook on Skype, click View > Facebook Updates from the Skype Contact list. 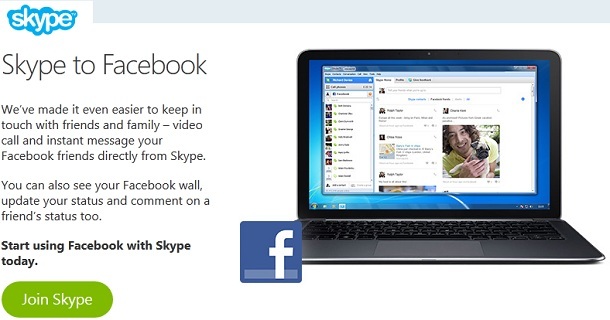 - Next, Skype users will need to allow access to their Facebook accounts to Skype v.5.0 for Windows. - In the dialogue window, click "See News Feed in Skype" to continue. - Skype users may need to sign in to their Facebook accounts. Enter your Facebook ID and password to continue. - Skype users will need to confirm access to their Facebook account. Click "Allow" to continue. - Accessing the Facebook Updates in Skype and clicking the "Facebook" tab will reveal your Facebook Wall, allowing Skype users to change your status message, comment on friends' wall posts, and more. To get started on calling Facebook buddies via Skype, open the contacts window in Skype. You will notice a new Facebook section. It will lists all the facebook online friends (the friends also using Skype with Facebook will be marked at green). You can make a voice call or a video call. Alternatively, you can call your friends mobile or landline as well. This is possible only if they've added them to their Facebook profile. This is basically using Facebook from your Skype account (calls are made via Skype). That is facebook video call feature is added to Skype software. Making Video calls from facebook directly using Skype is already available. If you have bought an iPad 2 and looking for a solution to make phone calls then you have arrived at the right post. Samsung Galaxy tab allows you to make phone calls (regular telecom provider phone calls) to mobile phone or other tabs, however normal telecom calls ain't allowed with iPad. But need not to worry as you can still make the cheap or free international calls on your iPad 2 with voip. With so many voip provider already in the market, making cheap or free calls is very easy. If you are wondering about the call quality, then don't worry as long as you have wifi/3g (offcourse you must be having wifi otherwise you wouldn't have got yourself an iPad). Many voip provider have started offering their own iPad 2 application, however a more generic solution to make phone calls on iPad 2 is using SIP. Today we will discuss about how to make phone calls on iPad 2 using SIP (or we can say SIP Calls on iPad). 1. First you need to register with a voip provider which offers free or cheap calls. I would suggest Localphone, as it allows SIP calls and the calls costs are also very low. Another good reason for choosing Localphone is that currently it is running a promotion. You will get free $1.5 on purchase of $1 credit, that's 150% bonus. 2. After registering with Localphone, you will see SIP settings in your account. Check SIP username and password. 3. Download WhistlePhone on your iPad 2. WhistlePhone offers free iPad 2 app which you can configure to make free or cheap voip calls. 4. Open the whistlephone app. Now you need to register with WhistlePhone. Just click Use a Generic SIP Account. 5. Now in the username add Localphone SIP username. If you face any problems in making calls, please let us know. We will try to help you all to make phone calls from your iPad 2. Reliance India Call and now RelianceGlobalCall are very famous services. Reliance Global Call is widely used by people to make cheap international calls. If you are in India and frequently make international calls then paying heavy to your telecom provider is a bad option. Using international calling cards is a better option and will help you save a lot on your phone bills. I was surfing the internet and came across the offer by Reliance Global Calls which is worth sharing. Call USA, UK, Canada, Singapore, China, Australia, Thailand, Germany, Malaysia, New Zealand, France, Russia, Itlay, HongKong at : 1.49 Rs per min. You can call Pakistan at just 1.99 Rs per min, Bangladesh at 2.99 Rs per min. You can call Saudi Arabia at 4.99 Rs per min. Please note that free talktime is calculated based on Rs 1.49 per min. This offer is valid till March 2012. Interesting thing is RelianceGlobalCall has launched its smartphone apps for iPhone and Android Mobile. This app is currently available free of cost. Download the app before it get paid. For more information, please check Reliance Global Call free 50 minutes offer page. Technology is growing and ways of communication are changing with tech growth. Earlier we used to send letters which is out now. It has been completely by SMS or text messaging. I guess, for the time being it will remain a great way to communicate with others. A lot of people use text messaging on their mobile phone to chat with each other. Infact many people (including myself) prefer to text rather to talk over phone. And with the smartphones used by most people, it is very easy and free to text. Thanks to applications like Whatsapp and Viber (which are too popular among smartphone users). The only problem is if you have to send a text message to a person not using these apps. Sending text message (using telecom service) proves quite costly, as these companies charge heavily for them. The only free option to send text message is to use internet. You must have been using Pc to SMS services, these are very popular and people use internet on their Pc to send sms to mobile. What if you have a similar service which you can use on your mobile. To come to your rescue, JaxtrSms app provides free sms from mobile to mobile. Today we will discuss about JaxtrSMS service. Its the same old Jaxtr which also offers free voice calls straight from your mobile. Earlier it used to offer click to call services (where you were given a widget to make calls). Jaxtr has launched its free application for your mobile using which you can send sms for free (both Local And International). Is it allowed to Non Jaxtr Users ? You can send messages to all the people in your address book whether they have the JaxtrSms app or not. SMS goes direct to your inbox and behaves like regular SMS. It also works on tablets. For sending sms you have the option to either use your own number or buy a new global phone number. 2. Send a text message to any other mobile phone, domestic or international. 4. Just download the application, install and start sending sms. I have personally tried this app on my android mobile to send sms to India. It works great, sms was received on other mobile in just few seconds. The best part is its free and it works on WiFi and 3G and on all devices. JaxtrSms works on : Android Mobiles, IOS devices (iPhone, iPad, iPod Touch), Blackberry Mobiles, Windows Mobile, Java Based mobiles apps, Symbian (Nokia) mobiles. If you are having a smartphone or a tablet and still your telecom provider for sending sms, then you are losing quite a lot of money. Trust me and try JaxtrSms (it is free), you are gonna love this amazing application. Localphone is a leading provider of cheap international calls. Their call rates are over 80% cheaper than the competition to more than 200 countries. You can call from your mobile, landline or computer. Download their internet phone for free and make calls from your PC to a mobile or landline for the same cheap rates or you can use their Local Numbers service to make cheap calls from your mobile or landline. Plus, calls between users of the Localphone internet phone are completely free! Localphone call rates are some of the cheapest around with calls starting at just 0.5¢ per minute. Calling to India is 1.5c per minute and you pay the same great price whether you call from your mobile, landline or computer. Unlike some calling cards, there are no hidden charges or monthly fees and the minimum top up is only $1. All new customers can try Localphone with a free 5 minute call! With the Localphone voucher FPBONUS you can get 100 free minutes to call India! Top up $1 and you’ll get $1.50 extra bonus credit when you use voucher code FPBONUS. This is the equivalent of 100 extra free minutes to call India and also makes the effective calling rate to India just 0.6c per minute! This bonus call credit can be used to call any country, it is not restricted to India. This voucher code is only valid for new customers on your first top up. 1. Click this Localphone link. 2. Register with Localphone. Try your first call for free. 3. When you buy credit from Localphone (as low as $1 - click add credit then other). Enter the voucher code FPBONUS. • Calls start at 0.5¢ per minute. If you are following Free Pc to Phone Calls blog then you are sure to save a lot on your phone bills. Making international calls is way cheap now, specially if you are making calls to India. Just follow our Free Calls to India tutorials and talk to your loved ones in India cheap or free! Many voip providers have started to offer unlimited plans to India. Today we will discuss about one such unlimited plan to call India by SimpleCall. SimpleCall is not new to this blog, we have already discussed in the past about SimpleCall, ways to make call using SimpleCall. So today we will focus mainly on the unlimited calling plan to India by Simplecall. 1. Plan Cost : $11.99 per month. 2. Free Minutes : 2000 per month. (So its not like completely unlimited, but still a very good deal). 3. In this plan, Simplecall allows calls from one registered phone number. Simplecall mentions that unlimited calls to India with hidden fees, contracts and registration charges. With the registered phone number you can enjoy Pinless dialing. If you are already using Simple Call (regular but not unlimited plan), then you can even use existing credit in your SimpleCall account to pay toward the SimpleCall Unlimited Calls to India plan. You can only purchase one plan per month, per SimpleCall account. You can call other destinations as well. Any calls to destinations outside India will be deducted from your remaining SimpleCall credit per the usual rates and terms. This will be separate from your unlimited call plan to India. Please go through the terms and conditions of this plan, before you opt for it. Only one unlimited plan purchase per account per month. Calls made to destinations other than India will be deducted per usual terms from your SimpleCall account credit. Fair Usage Limits: This plan is subject to a limit of 2,000 minutes in aggregate during its one-month length. This service may be used from landlines and mobiles to landlines and mobiles, for private, personal and non-commercial purposes only. Fair use means that calls made under this plan will be a reasonable combination of landline and mobile calls, that the majority of calls will be made outside of regular working hours (8:00 – 17:00), and are not to exceed a reasonable amount per day; usage may not negatively impact any other SimpleCall user. SimpleCall reserves the right to relinquish your unlimited calling service if the company has reason to believe the service is being misused under the guidelines listed above. Have you ever received a call from an unknown number with no caller ID or with a private number. Wondering what was that private number call. With voip getting popular and with use of more and more private numbers this thing is getting quite common. However with all this, the service to reveal caller ID or unmask your call or unblock your call is also getting very popular. One of the very famous service which provides this feature is Trapcall. It offers a service to reveal Caller id from those anonymous blocked calls or restricted calls. Trapcall is very popular in USA with many using on their landline, iPhone and Android mobiles. However this service was not available in Canada. But we have a good news for people of Canada. Trapcall is now available in Canada. The good thing about trapcall is that it does not require any special software download or installation. It can work on any phone be it mobile or landline. The programming step is quite easy and just click of few buttons on phone. How Does Trapcall work ? - After you register, you’ll simply key in a few numbers into your phone. - When you receive a blocked or restricted call, reject it. You don’t want to answer an unknown number anyway right? In a matter of seconds, the blocked call is sent to Trapcall servers, where it is instantly unmasked and sent back to your phone! All the while the caller hears a normal ring tone, oblivious to the fact that you know exactly who they are. - Now if you don't want to pick up his call (no anonymity anymore) then reject it for second time. Trapcall works on most carriers. And yes if you need an app for your smartphone then Trapcall has an app for iPhone, Android and Blackberry mobiles. If you have decided to go with Trapcall, you may be interested in our review as well. Turning your iPod Touch into a phone is a highly simple task now. With so many voip application available for iPhone and iPod Touch, you won't have to pay heavy to your telecom provider, just make cheap voip calls. Today we will be talking about another such voip application for your iPhone, iPod Touch and iPad, CrispApp. With Cripapp you can make phone calls to your GTalk / Google+ friends. It is also the best way to stay in touch with all your Facebook friends and the ultimate Voice Chat app that allows you to call your friends for free. You can make free calls to your facebook friends using Cripspp. Now it also allows to call from Facebook chat to fone app. Just send "/call" message and initiate a call from desktop Facebook chat to fone app. Keep track of all your chats and calls with message history. Similarly, Crispfone offers Chat for Gtalk users. Crispapp is compatible with iPhone/iPod Touch/iPad. It just requires iOS 3.1.2 or later. Well to het this Crispapp you have to shell out $0.99! For more info, visit Crispapp (Crispfone). Delmont Sarl and betamax service are very popular. A lot of people prefer betamax because of cheap rates and some of betamax services works charm for making calls to India from middle east (Dubai/UAE). Well, today we will discuss about VoipMove. It is a free program that uses the latest voip technology to bring free and high-quality voice communications to people all over the world. With VoipMove, you can also call regular phones in various popular destinations for free or call at an incredible low rate to any other phone on the planet. So first lets check the VoipMove calling rates. VoipMove Calls to India are charged at 1 cent per minute (including taxes). Calls to Pakistan at 2.3 cents per min. Call Bangladesh Mobile at 3.2 cents per minute. Call Mexico Landline at just half a cent and mexico mobiles at one cent per minute. Please note that though VoipMove calling rates are low, however it charges conection fees. All VoipMove calls are subject to a 0.039 US Dollar connection fee. How to make calls using VoipMove. Just download the voip client software from our website and call all your online friends (computer-to-computer) as long as you like, for free. From the textbox, enter the User Name of another VoipMove user, or the desired phone number and press enter. Double-click a User Name in your contact list. Use the dialpad to make a call just like you do on a regular phone. Or use the keypad on your PC. Please note that when you call a number (even if it's local) you should always dial 00 + countrycode + areacode + subscriber number. For more info, visit VoipMove. Fring is one of the most popular application to be used in your smartphone be it iPhone or Android mobile. I am using Fring for making international calls from my Android mobile and iPod Touch! Fring is very easy to use and you can use it for making SIP calls. If you are using any voip provider which provide SIP Calls but does not have iPhone/Android app, then configure its SIP settings in Fring and start making calls. You can also make free VoIP calls and Video callsto other Fring users. Fring also offers Fringout, its cheap international calling service. Today we will discuss about one of Fringout plans, Worldwide unlimited calling plan. Fringout Unlimited calls to 40 countries plan is available for iPhone/iPad and Android devices. This plan is available for $7 per month. No more than 3 hour per day. No more than 20 different numbers can be called per day and no more than 50 different numbers can be called per month. If you are having an iPhone or Android mobile and you make lots of international calls then surely this Fringout plan is worth trying. You will save a lot on your phone bills.